On August 14, 1886, a group of sporting gentlemen gathered in the Amsterdam with the purpose of establishing the “Committee for the Championships of the Netherlands for gentlemen amateurs in single scull outriggers”. The word “amateur” differentiated men who were paid to row or steer the boat and gentlemen who rowed for pleasure. The Committee allowed those from the gentlemen amateur group to participate in the annual regatta in the men’s single scull. On September 25, 1886, the first regatta took place. Until 1912 the regatta was known as the International Dutch Open Single Sculling Championships. The regatta maintained wide international renown. 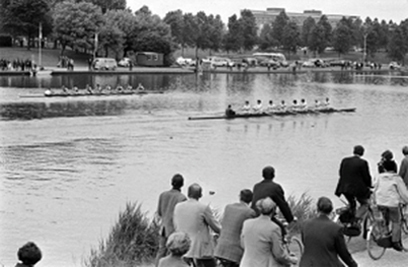 In 1931 the regatta was moved from the river Amstel to the temporary race course in Sloten, near Amsterdam, until it found its present site at the brand new Bosbaan in 1937. 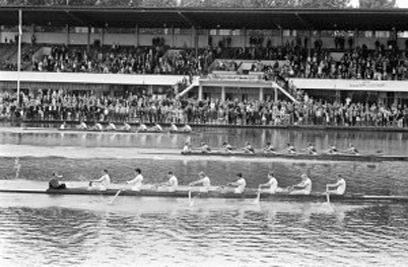 During the eighties, the Holland Beker experienced competition from a growing number of international regattas, which made it difficult to attract the top international rowers. After some German victories, several Dutch victories were celebrated in the late eighties and early nineties. There is a gap in the regatta’s history in the years 2001 and 2002. Only after the refurbishment of the Bosbaan race course in 2003 did the Holland Beker Regatta Association start anew. The organisation now includes the Royal Maas Yacht Club Rotterdam – replacing the Royal Netherlands Yacht Club as the organising group in 1994-, the Amsterdam Student Rowing Club Skøll and the Royal Dutch Rowing Association. In 2004 the name of the regatta changed back to the Koninklijke Holland Beker. As Holland’s most renowned international regatta, the Aegon Koninklijke Holland Beker will be hosting the World Rowing Cup III in 2019. Top rowers from countries around the world will travel to Rotterdam to compete and make this year’s event a great success. This year (2019) the Aegon Koninklijke Holland Beker will be hosted at the Willem-Alexander Baan in Rotterdam.